In the supermarket we were met by a wall of rosebud patterns and “I love you” text. Leftover Valentines? ‘Mother’ read the ornately scripted greetings. 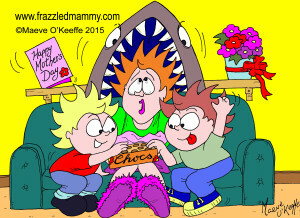 This entry was posted in Parenthood and tagged Cartoon illustrator, Cork, Ireland, Maeve O'Keeffe on March 11, 2015 by frazzledmammy.